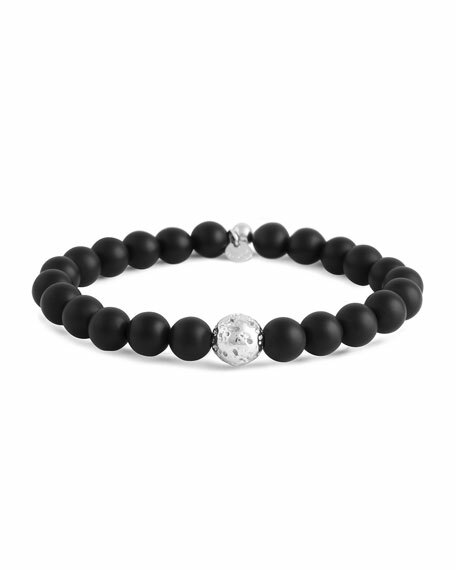 Tateossian men's bracelet with matte onyx beads. Center ruthenium-plated sterling silver lava bead with "lunar" surface. Alexander McQueen friendship bracelet with skull beads. Silvertone-coated brass beads. Adjustable fit. Approx. 2.8" diameter. Calfskin. Made in Italy. Black woven fabric. Sterling silver stations with signature John Hardy textures. Black onyx beads. Round logo clasp; adjustable length. Handcrafted in Bali.